Sitting in the center of their music class, Mountain View Middle School students expressed their curiosity. Each student pulled a vinyl record from its sleeve and examined it – some looking through the hole in the center of the disc. For this generation of aspiring musicians, even a compact disc is an ancient relic; a vinyl record had to feel like a fossil. On Jan. 10, PDX Jazz – a nonprofit cultural arts organization based out of Portland – visited MVMS and taught students about jazz music. Kim Harrison, director of education at PDX Jazz, provided a speech and a PowerPoint to students before handing out and testing some old records. Each student was invited to an upcoming concert and given the chance to submit an art project, which will be to design an album cover that describes jazz music. A handful of students in the audience had prior knowledge of jazz and its history, which Harrison said was exciting. 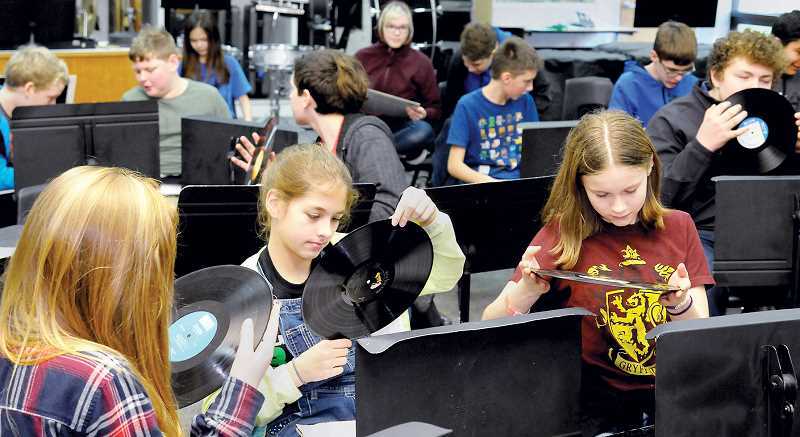 "It's really fun to do this presentation with kids who are musically savvy," Harrison said. "They have a lot of information already. It's exciting to see what they'll do for the art project." The presentation began with a video of four-time Grammy Award-winning bassist Esperanza Spalding – a Portland native – performing at the White House. In the video, Spalding explained that jazz is "America's classical music," which became an enduring theme of Harrison's presentation to the students. Harrison spoke about early jazz musicians like Louis Armstrong and Miles Davis, and how their influence connects with much of the popular music today. She said there is a direct line of influence between Armstrong, Frank Sinatra, Jay-Z and Drake. "We always talk about jazz as the foundation of popular music," she said. "We wouldn't have any of the music we listen to today if we couldn't take that lineage back to jazz musicians." While the influence of jazz musicians is felt in hip-hop and today's other genres, the popularity of jazz itself is declining. A 2014 report by Nielsen found that jazz was tied with classical music as the least-consumed genre in the United States, making up just 1.4 percent of music consumption. But a handful of students – and plenty of Oregonians, Harrison contends – have listened to jazz and enjoy it. 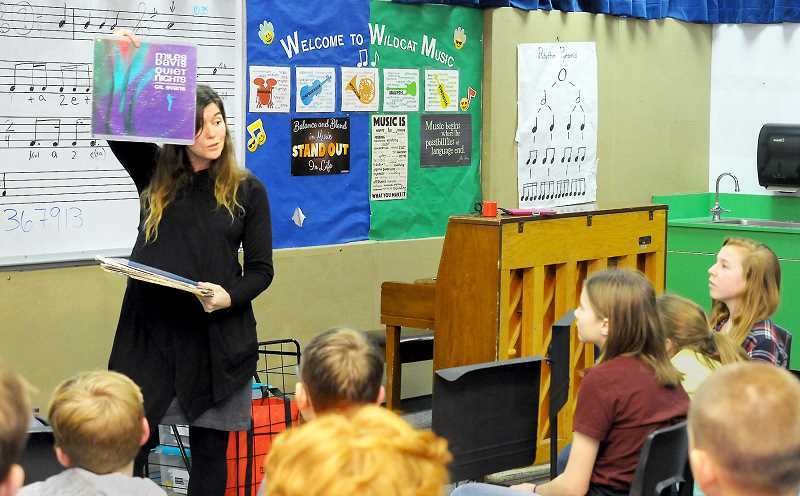 Some students, according to band and choir teacher Heather Tomiyama, are working with a professor at George Fox University on adding improvisation and jazz elements to their musical repertoires. The album art competition provides students an opportunity to blend the visual and auditory arts – and potentially have their artwork displayed in a gallery this summer. When the class attends an upcoming concert, Harrison said the students will be seated where they can see a professional musician playing the same instrument as they do. Tomiyama said she was thrilled to have Harrison come speak to her class and that she looks forward to the students experiencing jazz music firsthand in the future. "I'm always trying to get more presentations and influences into the classroom," she said. "It just gets them excited, gets their attention and keeps their focus." The Oregon Mayors Association and the city of Newberg invite students to share their ideas about what they would do if they were mayor. Students in fourth and fifth grades can submit a poster, while sixth through eighth grade students ust write a 500- to 1,000-word essay. Local winners will receive an iPad Air 2 and the deadline for submission is April 11. For more information, visit www.newbergoregon.gov. Ready for Kindergarten is hosting three workshops for parents of children ages 3 to 5. The workshops – held at Edwards Elementary School – are designed to help parents prepare their child for kindergarten and include a dinner beforehand along with childcare. Subjects include Language & Literacy on Thursday, Math & Reasoning on Feb. 21 and Social & Emotional Learning on March 21. Mathnasium of Sherwood is hosting a STEM + Families Math Night from 6 to 7:30 p.m. tonight (Jan. 16) at Ewing Young Elementary School. It will feature math games, snacks and prizes. For more information call 503-925-9990 or visit www.mathnasium.com/sherwood.